Nu Boyana Film Studios and B2Y Productions are glad to announce the official opening of our newest аsset – one of the biggest and most modern water tanks in Europe. After a year and three month of non-stop work we completed the brand-new water tank. We are extremely grateful to all of you who made this happen – especially Nikki Kanev – project manager and A&A Architects, Glavbolgarstroy and Sivon who designed and built it. The water tank is built on 1200 sq. meters. The basin is 20 meters wide at a depth of 6 meters and volume of 2400 m3. It has a 2.10 x 1.60 meters directors’ viewing window. The studio has 3 elephant doors for the trucks to access it. Inside we have a bridge crane with 10 tons lifting capacity for moving props, sets, etc. There is a special heating system at the studio which can heat the water in the tank up to 32 degrees celsius. The tank is using an UV filtration system that limits the chlorine usage. The facility is also equipped with a skimming system which removes all the dirt particles that fall on the surface layer of the water. 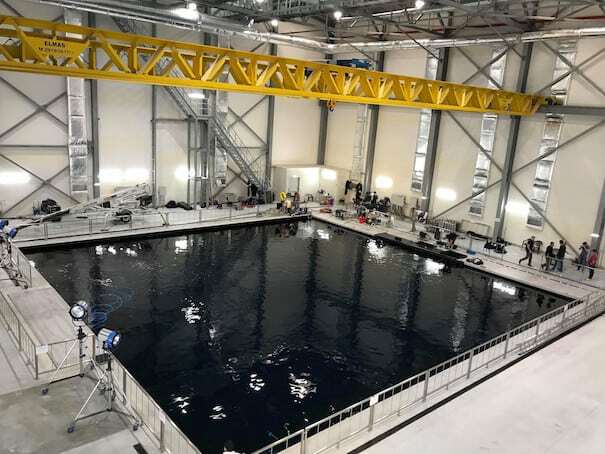 The facility is managed by our diving coordinator Ian Creed with background of movies like Star Wars:The Last Jedi, Angel Has Fallen, The Hitman’s Bodyguard and many more.